Ever watched live boxing? You should. No, you have to! I’m not joking. You and I watch prizefights on TV. We all do. Who hasn’t seen our national hero, Dr. Emmanuel D. Pacquiao, on a live telecast at the MGM Grand? We all watch. But in-the-flesh boxing? With your two eyes? It’s a must. Take last Saturday night at the Waterfront Cebu City Hotel and Casino. Four couples went out on a quadruple date: not to watch the movie “Taken” at the Ayala Cinema or to stargaze and hold hands at Tops or to drink vodka and dance until 2:30 a.m. at Loft. No. Holding hands, we watched boxing. Live. In the flesh. Chris Aldeguer and his beauteous wife Nia invited our barkada of marathoners—Frederic and Millette Chiongbian, Meyrick and Perl Jacalan, myself and Jasmin—to a slugfest smorgasbord. What sights did the husbands—and our wives, all first-timers—witness? We saw sweat. We saw faces that turned tomato red. We saw Milan Milendo remain undefeated. We saw the muscleman, Michael Domingo. Three times, the mouthpiece of one fighter flew from his mouth. We saw Joseph von Miñoza wear a Mohawk hairstyle. We saw Z Gorres batter his opponent like a six-year-old would pummel his toy soldier. We saw sweat and spit. Yes. You know, that fluid that gets spewed when a boxer’s abdomen gets thumped? On TV, you’re never showered with such discharge, right? Well, our group, positioned at the very front row—thanks to Chris A.—sat on the firing line: several moments we twisted back our necks and shut our eyes as rain drizzled inside Waterfront. What’s worse, Frederic and Meyrick, who brought along high-end Nikon cameras, sat at ringside—underneath that red pail where the boxers, ahem… spit—and got a downpour. This episode? On TV? Never. The round card girls. Ahhh. Since 88 percent who watch live boxing—in my estimate—possess male hormones, one attraction are the girls who wear scanty attire and possess long legs as slender as Paris Hilton’s. I’ll never forget, five years ago, the Manny Pacquiao vs. 3K Battery fight at The Fort in Taguig. Guess who their round-card girls were? Diana Zubiri and Juliana Palermo. Wearing bikinis, they received a “jumping-and-screaming ovation” that beat Manny’s standing ovation. This episode? On TV? Nah. What’s more, it’s not only what your eyes observe—it’s what your ears hear. Watching live boxing, you’ll hear screams and shrieks that you’ll never hear on that Samsung TV. “Panguli mo uy!” one man on the upper deck screamed. He was angry at two boxers who, in Round 1, barely pinched each other. “Kung wala ma knock-out, ha, draw mo ha, draw mo!” another shouted. True enough, the fight ended in a draw—and all laughed. 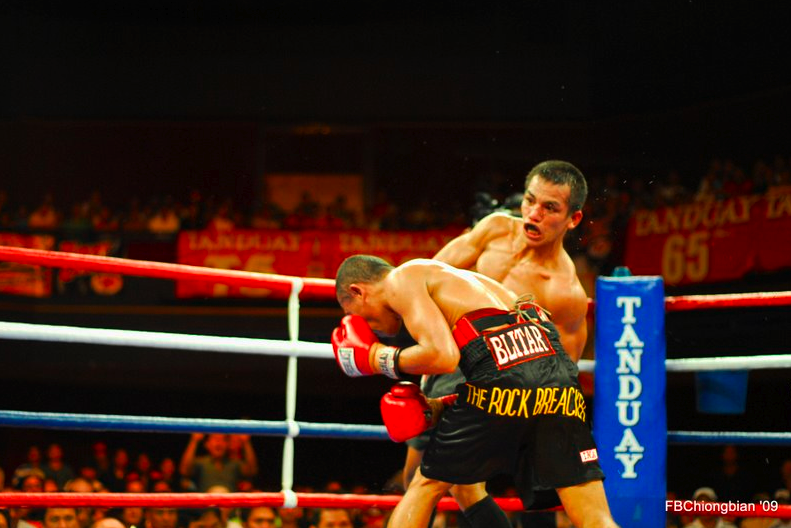 On another occasion, while the trainer of Roberto Leyva kept on yelling Mexican words to his fighter, one fan couldn’t resist and screamed, “Undang nag yaw-yaw uy!” Everyone roared in laughter. Ever hear these on TV? Never. How about observing the crowd? Inside the arena, you’ll see celebrities, government bigwigs, actors and actresses, TV personalities. Across from where we sat were Bill Velasco, Ronnie Nathanielsz and Dyan Castillejo—with their headphones, commenting for TV. Antonio Lopez Aldeguer, ALA himself, wore his trademark black sweater and, with a mix of excitement and anxiety, paced the Waterfront ballroom floor and, come fight time of his ALA boys, would position himself at the back. You’d see Michael Aldeguer, dashing in his dark black coat. Councilors Jack Jakosalem and Arsenio Pacaña watched from the stage. Celebrities? Not last Saturday but, during another Pacquiao fight I saw (against Oscar Larios) at the Araneta Coliseum, then-Senator Ralph Recto sat to my left and the comedian Ai-ai de las Alas to my right. Never on TV can you hobnob with such people.